The thing about public health and public health workers is that we are not healthcare providers in the strictest sense. While some of us may be nurses, physicians, or physician assistants, most of us never even come into direct contact with the people we’re serving. Even those who do “treat” people, e.g. give a vaccine or administer post-exposure antibiotics, are not in charge of the continuing care of the individuals. On the one hand, we’re protecting the health of the people. On the other, it’s not entirely up to us. This causes some friction, especially when a provider thinks that he or she should be the final arbiter of what to do with their patients. Take, for example, a certain pediatrician to the stars. This pediatrician has said over and over that his decades of experience in medicine and his gut feelings dictate his approach to immunizations. He believes that some vaccines undoubtedly cause bad things, and that vaccines should be spaced out as much as possible, if they are to be given at all. For his individual patients, that’s fine. It’s really between he and his patients how he is to tend to their healthcare needs, so long as he practices a standard of care that is not negligent and does so in the best interest of his patients. However, for the population at large, this is not a good thing. It’s not good to erode herd immunity against things like measles or mumps. It’s not good under any circumstance. There was once a kid in a very large university who came down with bacterial meningitis. He had been at a party and allegedly “hooked up” with several young women that night. We did our best to track down those contacts, and everyone else at the party. When we did, we notified them of a possible exposure to bacterial meningitis, and we advices them to go into their local health department to be given antibiotics or to go see the university’s health providers, or to go see their own physician. Well, there was one physician who saw one of the young ladies in question and refused to give her antibiotics. He said that she said that the case and her never really hooked up. They just sat on a bed in a room at the house where the party happened and talked, nothing more. So the physician took her word for it. This triggered a huge discussion on what to do with her. Would we ask the physician at the local health department to give her the antibiotics anyway? Would we respect her physician’s decision, albeit a questionable decision? What to do? In the end, the local health department staff reached out to her and explained to her the situation. She was told that she could be in danger if there was any chance that she and the case shared any spit, even incidentally, at the party. (He had fallen most ill about a day after that party, so he was very infectious when he went to it.) She opted not to chance it. Days later, her physician apparently complained about being overruled. And that’s not the only example I’ve seen or heard of where private practice providers clash with public health practitioners and workers. It seems to be a constant struggle. I don’t see it as a bad thing, though. There must be an interest in providers to take care of their patients, even if jealously so. And the must be a willingness of public health workers to do their due diligence, even if that means stepping on the toes of private practitioners. All as long as we’re all doing it in the best interest of the patient. So how do we deal with people who refuse vaccines even though they’re licensed healthcare providers who should know better? Or those who refuse to give vaccines and whose action, or inaction, may lead to an outbreak of a serious disease in the community? I don’t know. It’s above my paygrade to figure out those things. But I have passed this discussion on to a friend who is about to enter a Doctor of Public Health program. I hope his education in that program covers these issues because we need answers. We need guidance. We need to figure out who supersedes whom when it comes to serious disagreements like vaccines, fluoridation, or even antibiotic use. I’d like to say that evidence supersedes all personal or professional opinions, but the world doesn’t work that way, sadly. In this world, we need to deal with each other, work with each other, and do it all in the best interest of the public and their health. “My reasons for not vaccinating – what are yours? Vaccine antigens cause a short term response as measured by antibody count (titer tests). The first problem we encounter is that, when tested after a few weeks those antibodies are, in most people, not present anymore. The next problem is that there is no study proving that a high antibody count actually protects from or prevents disease outside of the lab (real world). The third problem and major issue I have with vaccines is their effect on the immune system. In recent years science has learned that the human immune system is much more complicated than we thought. It is composed of two functional branches or compartments which may work together in a mutually cooperative way or in a mutually antagonistic way depending on the health of the individual. One branch is the humoral immune system (or Th2 function) which primarily produces antibodies in the blood circulation as a sensing or recognizing function of the immune system to the presence of foreign antigens in the body. The other branch is the cellular or cell-mediated immune system (or Th1 function) which primarily destroys, digests and expels foreign antigens out of the body through the activity of its cells found in the thymus, tonsils, adenoids, spleen, lymph nodes and lymph system throughout the body. This process of destroying, digesting and discharging foreign antigens from the body is known as “the acute inflammatory response” and is often accompanied by the classic signs of inflammation: fever, pain, malaise and discharge of mucus, pus, skin rash or diarrhea. These two functional branches of the immune system may be compared to the two functions in eating: tasting and recognizing the food on the one hand, and digesting the food and eliminating the food waste on the other hand. In the same way, the humoral or Th2 branch of the immune system “tastes” and recognizes and even remembers foreign antigens and the cellular or Th1 branch of the immune system digests and eliminates the foreign antigens from the body. But just as too much repeated tasting of food will ruin the appetite, so also too much repeated stimulation of the “tasting” humoral immune system by an antigen will inhibit and suppress the digesting and eliminating function of the cellular immune system. In other words, overstimulating antibody production can suppress the acute inflammatory response of the cellular immune system! This explains the polar opposite relationship between acute discharging inflammations on the one hand and allergies and auto-immune inflammations on the other hand. The more a person has of one, the less he or she will have of the other! A growing number of scientists believe that the increase in America, Europe, Australia and Japan in allergic and auto-immune diseases (which stimulate the humoral or Th2 branch of the immune system) is caused by the lack of stimulation of the cellular or the Th1 branch of the immune system from the lack of acute inflammatory responses and discharges in childhood. We need to identify the factors which cause this shift in the function of the immune system or which cause allergies and auto-immune diseases in childhood to increase! If we now return to the original question of the mechanism of action of vaccinations, we find what I believe is the key to the puzzle. A vaccination consists of introducing a disease agent or disease antigen into an individual’s body without causing the disease. If the disease agent provoked the whole immune system into action it wouldcause all the symptoms of the disease! The symptoms of a disease are primarily the symptoms (fever, pain, malaise, loss of function) of the acute inflammatory response to the disease. So the trick of a vaccination is to stimulate the immune system just enough so that it makes antibodies and “remembers” the disease antigen but not so much that it provokes an acute inflammatory response by the cellular immune system and makes us sick with the disease we’re trying to prevent! Thus a vaccination works by stimulating very much the antibody production (Th2) and by stimulating very little or not at all the digesting and discharging function of the cellular immune system (Th1). Vaccine antigens are designed to be “unprovocative” or “indigestible” for the cellular immune system (Th1) and highly stimulating for the antibody-mediated humoral immune system (Th2). Perhaps it is not difficult to see then why the repeated use of vaccinations would tend to shift the functional balance of the immune system toward the antibody-producing side (Th2) and away from the acute inflammatory discharging side (the cell-mediated side or Th1). This has been confirmed by observation especially in the case of Gulf War Illness: most vaccinations cause a shift in immune function from the Th1 side (acute inflammatory discharging response) to the Th2 side (chronic auto-immune or allergic response). The outcome of this line of thought is that, contrary to previous belief, vaccinations do not strengthen or “boost” the whole immune system. Instead vaccinations overstimulate the “tasting and remembering” function of the antibody-mediated branch of the immune system (Th2) which simultaneously suppresses the cellular immune system (Th1) thus “preventing” the disease in question. What in reality is prevented is not the disease but the ability of our cellular immune system to manifest, to respond to and overcome the disease. This is the guy I told you about before, the one who thinks that his daughter’s type I diabetes was caused by the hepatitis B vaccine she received months earlier, the one who thinks he did “academic research” in writing his book. He claims that he’s not anti-vaccine and that he just wants to inform the public so that the public can make their own decisions. “Inform,” I don’t believe that word means what he thinks it means because that whole bunch of drivel up there, all that stuff, it’s chock-full of misinformation. 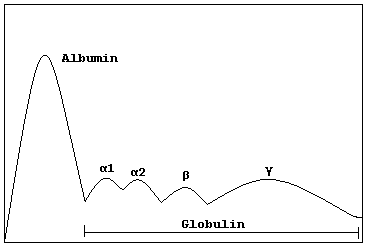 See the gamma globulins all the way on the right? They’re your antibodies. They’ll always be there unless you get sick, in which case you get an infusion of antibodies from a donor to keep you safe from infections. This guy is outright lying when he says that antibodies disappear. They don’t, and that’s why so many vaccines will give you long-lasting immunity. He then dives into the whole “Th1 vs. Th2” thing, but he gets it completely wrong. Here’s what that system is all about: Th1 is about intracellular pathogens, like viruses. Th2 is about extracellular pathogens, like bacteria and fungi. But anti-vaccine people read that “Mercury depletes glutathione and polarizes toward Th2 dominance” and they went nuts over that. Mercury will do that to people. But there are reasons why this isn’t the case with vaccines. First, the amount of mercury in vaccines was negligible before manufacturers removed all thimerosal (a mercury-containing compound much like salt is a chlorine-containing compound). Even when we do get thimerosal from a vaccine (usually the flu vaccine nowadays), the amount is negligible, and our bodies are really good at dealing with it. Again, it’s all in the chemistry. But, true to anti-vax ideology, this guy swallows the lie hook, line, and sinker, and it seems to me that he wants you to do the same. But, hey, if you want to believe him, go ahead and spend hundreds of dollars on a lab test you probably don’t need. I’d really like to meet these scientists and explain to them that the Th1 component really is being stimulated all the time because we’re under constant bombardment by viruses and other intracellular pathogens. Then again, I don’t think these scientists are a “growing number” of them. Rather, I suspect they are the few anti-vaccine “scientists” who like to claim things that aren’t. 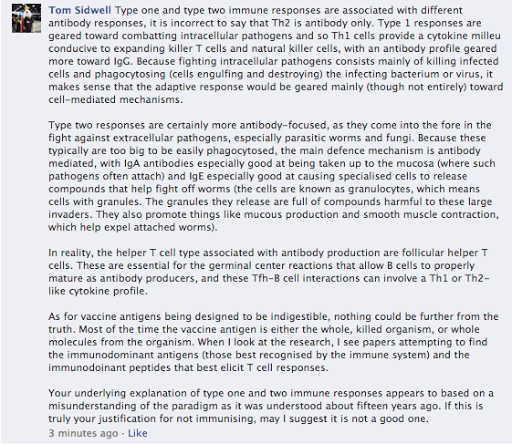 This is how I know this guy knows absolutely nothing about immunology. See, when an antigen is introduced into your body — an antigen that shouldn’t be there — macrophages eat that antigen and then present it to your T helper (the “Th”) cells. So, as you can see, the immune system is involved in everything from antigen response through absorption, digestion, and presentation to T helper cells; to B cells, cells that are not even part of the Th system. It is complex, and that’s why he’s getting it all wrong… All of it! It’s as if he can’t read Wikipedia or something. The more he posts on his Facebook page, the more I’m convinced he’s one chicken McNugget short of a Happy Meal®. I bet it gets deleted because it’s full of truth. I don’t usually associate apologetics with scientific concepts. I associate them with religious things. Often, you have people on the radio or on television, defending their faith. I don’t blame them nor find any fault with this. For things that are untestable, apologetics is a good way to defend beliefs. For science, we have evidence. You either believe the evidence or you don’t. If you don’t believe in something that is tangible, testable, and objective, then you’re a denialist. 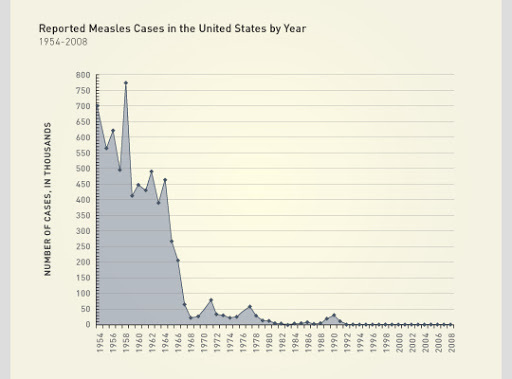 Can you see when measles cases dropped precipitously? When did we start having sewers or washing our hands in the United States? Sometime around the 1960’s? Nope. The reason why improvements in hygiene and food preparation don’t do anything against infections like measles, rubella (German measles), or chickenpox, is that these infections are transmitted through droplets suspended in the air. You can scrub down a room until you can eat off the floor and still have measles suspended in the air if a person infectious with measles had been there a few hours earlier. You can hermetically seal all food, water, and waste, and these viruses would still linger in the air. The best infection prevention against measles is to cycle the air in a room through a filter or let the room stand unoccupied for several hours and then scrub it down once the droplets settle onto surfaces. The thing is, you wouldn’t know that these droplets were there because they’re microscopic. Furthermore, someone with measles is infectious a few days before they get any symptoms. So you could very well have a healthy person walk into a room and contaminate the hell out of it. Click to enlarge, won’t you? So, no, I’m not apologizing for vaccines. I don’t need to. The evidence is there. It is clear. It is testable. It is objective. Let whoever has ears (and eyes and intelligence) to understand the evidence listen and learn and help us move forward as a species. 1. You get exposed to a bacteria or virus. 2. Specialized cells called macrophages (or neutrophils) gobble up the bacteria or virus (or fungus or whatever), and digests it with some enzymes and other chemicals. 3. The macrophage then presents the bits and pieces of the virus or bacteria it just ate. To whom? They present it to B lymphocytes and T lymphocytes. 4. B lymphocytes take the bits and pieces, also called antigens, and create specific antibodies against it. 5. The antibodies attach to circulating viruses and bacteria, inactivating them and marking them for destruction by the T lymphocytes and additional macrophages. 6. If you survive this first encounter, the B lymphocytes go dormant, waiting for the next time you’re infected. 7. If you get infected again, the B lymphocytes are pressed into action again, but they produce the antibodies to which they are already coded, and they do so furiously. New B lymphocytes go back to step 4. Of course, this is the “quick and dirty” description of what happens inside of us when we are exposed to viruses and bacteria that cause disease. The actual process is much longer and complex, too long and complex to explain here. But you get the point. You’re exposed, you make antibodies, and, if you’re exposed ever again, you respond quickly and vigorously, preventing the new infection from gaining a foothold and making you sick. This is the reason why some diseases like chickenpox usually only attack us once. The “memory” of the dormant-then-activated B lymphocytes lasts long, and the chickenpox virus is antigenically similar from one wave of infections to the next. That is, the antigens don’t change in shape, and the antibodies can attach to the new infection as easily as they did when they first defended you. There are some exceptions to this reaction, also called an “anamnestic response”. There are times when the interval from one infection to another is too long, and the dormant B lymphocytes end up dying and are unavailable to defend you when the second infection occurs. There are also times when you have an underlying medical condition that prevents those B lymphocytes from responding. Or, if they do respond, the other cells cannot come along for the ride and help in the defense of your body. The best way to keep your body always primed and ready would be to be continuously exposed to the disease. And that was the case when chickenpox and measles were around, killing people. You’d be exposed over and over since you were very likely to come into contact with a person who had them when you were a kid, when you had your kids, when your kids had kids, or if you were a person who had a new batch of snot-nosed kids to deal with every so often – like a teacher. 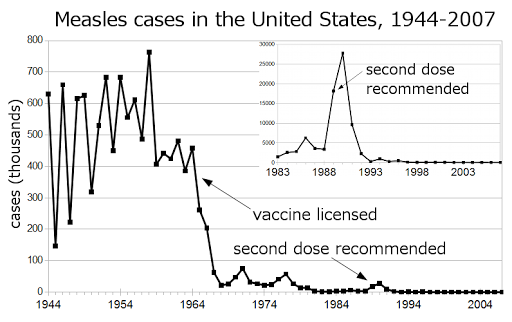 One thing that vaccines did very well was to make cases of things like chickenpox dwindle and almost disappear. Instead of getting the infection and the high chance of bad outcomes from it (e.g. encephalitis, skin infections, or pneumonia), you just got a shot full of antigens – the bits and pieces of the virus – and your immune system would be primed and ready, sans actual disease. However, instead of being re-exposed from time to time, you no longer are exposed. If your B lymphocytes die off, then you’re not immune to the disease anymore. This is why we need boosters. Boosters work, and they work well. However, vaccines don’t work as well with viruses whose antigens change quickly, or whose natural reservoir is not humanity. This is the case with influenza viruses. Type A and B viruses can infect humans, pigs, birds, horses, dogs, and even some seals. So we can get rid of the viruses from humans, but they’ll just go hang out with pigs until a non-immune person gets exposed to them. Also, influenza viruses change their antigens almost yearly. To our immune system, this year’s flu is not caused by last year’s flu. Our dormant B cells can throw off antibodies, but those antibodies are not adept to neutralizing this year’s flu if they were created against the flu from years ago. During the 2009 flu pandemic, there was an interesting phenomenon occurring in the populations that were infected. Children were making plenty of antibodies against the new flu virus. Older adults were making plenty of antibodies against the new flu virus. But young adults and adults were not making these antibodies. What the heck, right? We’ll get back to that observation in a second. An epidemiologist made an interesting observation about the immune system some years ago. He noticed that people exposed to a flu virus (say it is “flu X”) would make really good antibodies against that flu X. If they were exposed to flu Y, however, they would make a lot of antibodies against flu X, but very little against Y. When he took into account these people’s age, he noticed that they belonged to a subset of people that had not seen an epidemic of flu X ever, but were old enough to have seen flu W, M, or flu N at some time. On the other hand, people who had seen flu X when they were very young or had not seen any flu of any kind, well, those people made plenty of good antibody against flu Y. This epidemiologist called this observation the “Original Antigenic Sin” theory. He theorized that people who had seen other flus would make antibodies only against the flu they had originally encountered when they were children. Their antibodies were being made by the dormant B lymphocytes that were called to action after the new infection. These people were young adults and adults, and they didn’t do well with new flu viruses because that reaction from old, dormant B lymphocytes was vigorous enough to trick other B lymphocytes into thinking that enough was being done. However, the reaction was not specific enough to deal with the new flu. Immune response is not indicative of disease outcome, by the way. During the 2009 pandemic, epidemiologists saw that older adults were not getting sick as much – or as severely – as younger adults. One of the things that explained this was this concept of original antigenic sin. Another thing that explains it is that older adults are more likely to be consecutively vaccinated for quite some time because they’ve been placed on the recommendation list. One other thing that could explain this was that these older adults had been exposed to the same H1N1 virus many years prior and had some sort of “lifelong” immunity against it. Remember, during the pandemic, children were affected just as bad as young adults, throwing the original sin theory out the window. They made a lot of antibodies, but this wasn’t a sign that they fared any better. It was that last point that didn’t make much sense. Yes, the 2009 H1N1 virus is similar to previous H1N1s seen in history, but, from an antigenic point of view, it was new. It was novel. And that novelty is the only thing that explains why it went around the world so quickly. Unfortunately, many in the media, in public policy, and – why else would I be well into 1,300 words of this post? – anti-vaccine people, believe that grandma and grandpa Smith, at the age of 70+, have an immune system that remembers a virus from decades ago. 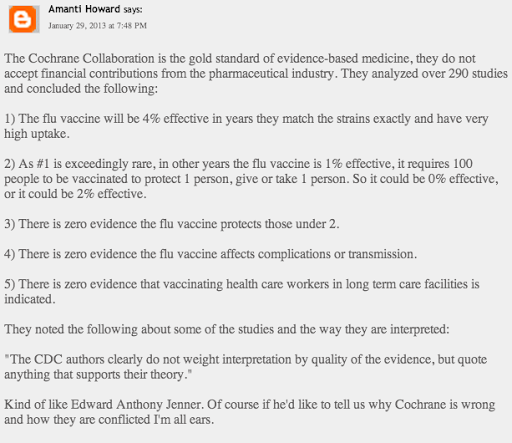 And it’s that last point that anti-vaccine people have been harking for a while now, and especially in light of the current 2012-13 H3N2 flu season that has been so heavy. They claim that children should be exposed now to this potentially deadly flu in order to get “lifelong” immunity, and they use that observation from the 2009 pandemic as an explanation. When presented with the possibility that older adults fared better because of consecutive immunization, they scamper away or present some bogus explanation. When presented with the evidence that children didn’t do so well in 2009, they also counter with poor science and really no good evidence. In essence, the anti-vaccine crowd would very much like to have kids exposed to a potentially deadly pathogen instead of being vaccinated because, in their minds, it will lead to lifelong immunity and none of the “dangers” of vaccines. They do this for measles, for chickenpox, for whooping cough, and now for flu. They ignore all the families who have been severely affected by influenza, some whose children have died and others who have been left with severe consequences of their infection. Worse, with regards to the flu, they ignore that the flu mutates very fast and has other animals as reservoirs, making our immune system susceptible to it every year, almost like clockwork. Of course, almost like clockwork, anti-vaccine people will say that we all survived past pandemics and epidemics, so the flu isn’t deadly. This is almost like saying that we all survived World War II, so that war wasn’t deadly. That is, they have very different definition of deadly. And you can tell that they do because they say a vaccine is deadly while things like polio, measles, and flu are not. All the evidence says they are deadly. Very deadly. So, now that you have this information, you’ll be able to counter the argument that an exposure to flu now is a guarantee to immunity later. Tell them that it doesn’t work that way with flu because it mutates fast. When they bring up what happened in 2009, tell them about the original antigenic sin and how they’re misinterpreting it. Then, when they bring up someone who didn’t die from the flu, bring up someone who has… And then ask for someone who has died from vaccines. If you fill up a stadium with the number of people who have died from flu, you’d only need to fill a seat or two to represent the number of people who have directly died from a flu vaccine. Again, anti-vaccine people are not good gamblers.